Do You Dream? Thanya Iyer asks us. It’s an unusual question, mostly because of how it’s phrased. 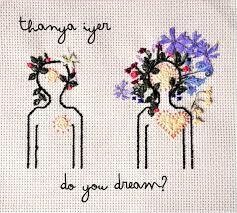 Iyer is seemingly uninterested in what or who we dream about but simply if, like all humans, we experience the involuntary process of dreaming. The answer is so obvious that instead of giving us a stock of her own dreams to use, Iyer gives us a soundtrack for our subconscious. A complex labyrinth of sounds that morphs to the uniqueness of an individual’s mind. Iyer builds this soundtrack with an all-star cast of Montreal musicians including Daniel Gélinas – who on Bandcamp is credited with playing “Dried Clementine Peels” but can also be seen playing water in the live video for “Daydreaming,” which captured our attention earlier this year – Alex Kasirer-Smibert, Sarah Pagé (Barr Brothers), and lots more. The resulting group make a rapidly spinning and entrancing carousel of jazz, orchestral-pop, and experimental music that doesn’t stay still long enough to be labeled as something singular. Do You Dream? risks spinning off its perch entirely if it wasn’t for Iyer’s unfailing and dynamic vocals – a constant source of intrigue and emotion throughout. Songs like “500 Hours,” “Daydreaming,” and “Sail Away,” are ghostly and mysterious in their piano and string tinkering, vocal distortions, or swirling background noises but lyrically they are very much of the body. Other tracks are no less mysterious sounding but are warm to the touch: the welcoming sound of the oboe (Krisjana Thorsteinson) on “Loss” or the group vocals of “Can We Be Still” are all signs of life, love, and comfort among the chaos. The “themes” scattered throughout the album act as intermissions from the ongoing instrumental intricacies. Adorned with whimsical names, (“Flower Person Theme”, “Tender Thunder Theme”, “Dragonfruit Theme”, and “Polyester Chu Chu Train Theme”) these songs do sound like they were made with classroom instruments or children’s toys found at someone’s yard sale. The latter theme – stretching over five minutes – is the most exhaustive of the bunch. Beginning with the whistle of birds and a train, “Polyester Chu Chu Train Theme” barrels through a barrage of hazy instrumentals, picking up the threads of previous songs (“500 Hours” being the most recognizable), and dropping us off in some weird delirious state. In all, Do You Dream? is an extensive, engrossing listen and a dreamer’s paradise.